The long-established Kumihimo store since 1925, Three-mallet brand Watakei. Obi-jime and Obi-age are the crowning touches for the kimono. Hence we never compromise on our products. Because our Kumhimo products take up the virtue of kimono and obi emphasizing the existence of one string, their clear colors and combination bring a piece of mind for those who wear or stare at Kimono. 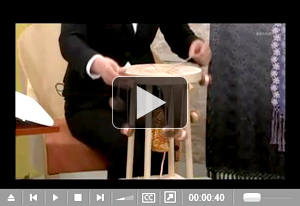 Furthermore, the excellent elasticity and strength originated from the braiding technique prevent kimono from becoming the worse for wear. 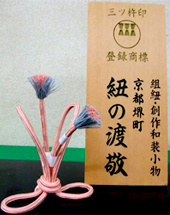 Watakei as a specialist of braiding and color have been instrumental in creating the culture of braiding in Kyoto. Our pride is in the three-mallet brand. We appeared on KBS Kyoto TV , Pogipogi Tamago ”Kyoto-taste”. Our technique “Kumihimo” was introduced as a top quality that made someone feel the bonding of Braid culture. We have continued to making our original products by performing tie-dyeing technique and kinsai (gold dyeing) on the high-quality textures made in Tango where there are plenty of weaving craftsmen for silk crepes. Variety of shawls of top quality made with hand embroidery and Hitta shibori and Kasamaki shibori. Other kimono accessories include braided and woven bags, and “zori” or Japanese sandals. Copyright©2012 WATAKEI Co.,Ltd. All Rights Reserved. Homepage made by hotfirm Co., Ltd.